More and more households are ditching the harsh cleaning supplies full of toxic chemicals and switching to more environmentally friendly alternatives that you probably already have in your pantry. One of the best natural and economical cleaning ingredients is vinegar. Not only is vinegar the perfect ingredient to use in all-natural organic cleaning products, but you can also use vinegar in the garden. If you want to grow an organic garden, then you need to ditch the chemical pesticides and toxic plant foods and choose to use vinegar instead. Vinegar is an all-natural ingredient that can be used to both clean and kill germs. When used correctly, it will also give life to your flowers, fruits, and vegetables in all your outdoor spaces. 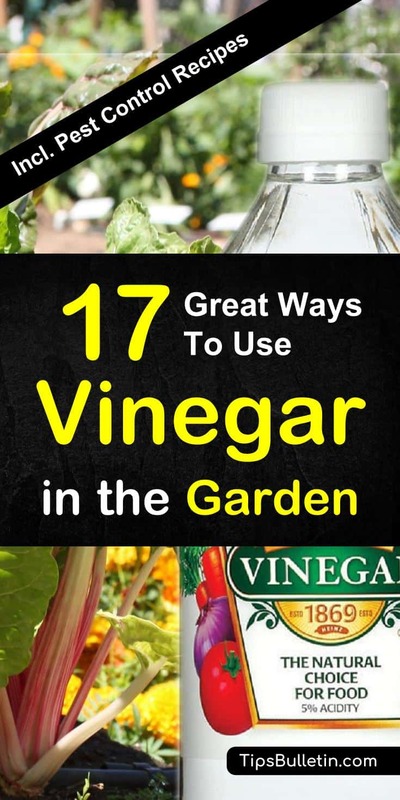 Whether you have white vinegar or apple cider vinegar, using vinegar in the garden will give help your garden thrive and make it the envy of the neighborhood. For centuries, vinegar has been a miracle ingredient that has been used to clean our homes, improve our health, and assist us in the garden. Along with being great for getting rid of garden pests, vinegar has numerous applications for use in your garden, including using it as a copper cleaner for pots, keeping flies away and trapping fruit flies. A typical use of your household vinegar in the garden is as an all-natural, organic weed killer. When spraying it around specific plants, you have to be careful as it can be harmful if you use too much. Spraying pure white vinegar on hard-to-kill weeds will have them disappear in a couple of days. In a gallon bucket, combine the distilled vinegar, liquid dish soap, and cup of salt. Stir the mixture to dissolve the salt. Pour the vinegar mixture into a plastic spray bottle and spray the affected area to rid your garden of those pesky weeds. If you suffer from invading ants during the summer months, you can use vinegar to deter them from your garden or even kill them. Fill a spray bottle with a solution of half water and half vinegar. To kill them, spray the solution directly onto the ants. It is one of the best ways to permanently get rid of ants around your home and garden. If you only want to deter them, spray the solution around your walkways, the walls of your garden, and on the anthills to keep them out of your garden. You can also spray the vinegar around your home to keep ants and houseflies away. Vinegar is also the perfect solution to keep ants out of cat food. Spray the solution anywhere the ants can enter your home. There are some seeds like nasturtiums and okra that are extremely hard to germinate. You can soak these stubborn seeds in a bowl of water and a few drops of white vinegar overnight to make the process easier. The next day, plant the seeds in your garden to see quicker results. One of the most frustrating garden pests that you will have to deal with is fruit flies. These tiny pests can be an absolute nightmare when you are trying to protect your plants and fruit trees. One of the best ways to get rid of fruit flies is to trap them. You have to trap fruit flies if you want to keep them at bay. To do this, you can fill a jar with apple cider vinegar and some liquid dish soap to create a fruit fly trap. The smell of the vinegar will lure the fruit flies into the pot, and the dish soap will cause them to sink into the jar, trapping them. For more check out our tips on easy-to-make DIY gnat traps. Terracotta and clay pots are a popular choice for gardeners because of their durability and ability to provide cooling soil for plants even in extreme heat. Unfortunately, clay pots are notorious for absorbing calcium, salt, and other minerals that can leave them covered in unattractive white stains. You can clean your pots quickly with vinegar by making your own homemade all-purpose cleaner. Combine the water and white vinegar in a small bucket. Add the clay pots to the solution and let them soak in the solution for thirty minutes to dissolve the stubborn mineral buildup. Remove from the vinegar and water and let dry. To remove rust from your garden tools easily, spray them or soak them with undiluted vinegar. 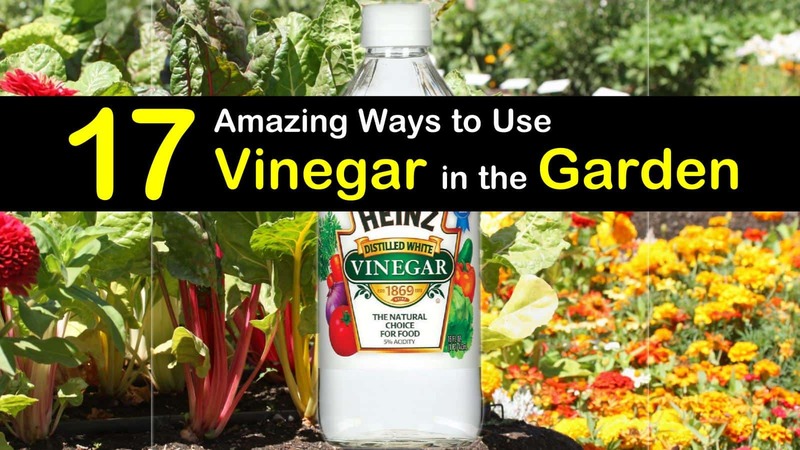 It is one of the fastest rust removal ways to use vinegar in the garden. Allow the vinegar to sit on the tools for several minutes, then wipe them down. This process will get your garden tools looking good as new. One of the perks of having a flower garden is being able to display fresh cut flowers in your home. Unfortunately, once you cut the stems, their lifespan is reduced significantly. Without their roots, which are responsible for supplying the nutrients the plant needs to survive, even the hardiest of flowers will begin to wilt after a couple of days. To help prolong the life of your fresh cut flower bouquets, here’s what you need. Fill your vase with the water. Add the vinegar and the sugar to the vase and stir to combine the ingredients. Add your fresh cut flowers. Change the solution every couple of days to keep your fresh cut bouquet of flowers around for weeks. Raccoons, rabbits, and household pets like dogs and cats can be a nightmare for any garden. As cute and fluffy as they are, to keep these unwanted animals from destroying your plants, soak a few items in distilled vinegar and place them around the perimeter of your garden to keep them from getting close. While vinegar can kill many common plants, others like hydrangeas, rhododendrons, and gardenias are acid-loving drought-tolerant plants that thrive on acidity. Combine a gallon of water with one cup white distilled vinegar and use it the next time you water these plants. For plants that don’t love acid, you can add some white vinegar to your soil to fight hard water and lime. If you have some outdoor furniture or benches near your garden, you may know how hard it is to keep them clean. You can use vinegar to clean these pieces and leave them sparkling and germ-free. It works perfectly to clean patio furniture. Just wipe down all your outdoor furniture with a cloth soaked in vinegar. One of the most notorious and damaging pests for your garden are slugs and snails. Just as with ants or gnats, to get rid of these garden pests, you can spray them directly with a mixture of distilled vinegar and water. When you start to get unwanted weeds growing through the cracks in your driveway and sidewalk, you can use vinegar to get rid of them. Just like other natural garden weed killers, like baking soda or epsom salt, white vinegar is an excellent weed killer. All you need to do is spray pure white vinegar onto the affected areas to get rid of the unsightly weeds. If you struggle with fungus and mold on your plants, vinegar can help. White vinegar is known as one of the preferred ways to kill mold at home, which also works great for your plants in the garden. Vinegar is a great fungicide that can help you protect your plants from these frustrating conditions. The vinegar fungicide recipe is simple to make and easy to use. Brew the chamomile tea and add the two tablespoons of vinegar. Pour the solution into a spray bottle and spray any plants in your garden that are affected by mold or fungus. This solution is perfect because it’s safe and organic. The ugly water lines that can form on your old vases can put a damper on your freshly cut garden bouquet. White vinegar is such a fantastic natural glass cleaner. You can remove them by filling the vase with a solution of half water and half vinegar or use a paper towel soaked in vinegar to wipe it clean before adding your flowers. It is essential to keep the water in your birdbaths and fountains clean so that the birds don’t pick up any dangerous bacteria from the dirty water. To keep your birdbath pristine, scrub the bath with white vinegar once a week. This will help ensure that the water in the bath is always clean and will cut down on algae growth and eliminate any unwanted smells. Being able to grow berries in your garden is a beautiful thing until you have to harvest them. Anyone who has collected berries before knows just how difficult it can be to clean your berry-stained hands. You don’t have to scrub your hands until they bleed anymore; instead, you just have to wash up with a small amount of distilled white vinegar to quickly remove the stains. You can quickly clean your fresh vegetables by combining a quart of water and one tablespoon of white vinegar. Adding the vinegar to the water will ensure that any harmful bacteria is wholly removed. Since vinegar is an acetic acid, you have to take care when using it on your plants in the garden. If you use too much vinegar over an extended period of time, it will eventually kill your plants, with the exception of the acid-loving plants like hydrangeas and azaleas. You should take care when spraying any solution that contains vinegar directly on the stems and leaves of your plants as it will effectively strip the protective coating from your plants. You should no longer relegate your vinegar to cooking and cleaning at home. Bring this miracle ingredient outside and let its power work for you in your garden. If you want your garden to be organic, stop using the harmful pesticides that contain toxic chemicals and start using vinegar today. We hope you enjoyed the information presented in this article and please feel free to share it with your friends and family. I'm a stay at home mom, cleaning nerd, avid wanna-be cook, and crazy passionate container gardener.